Hardships, difficulty and trials are the crucible which God uses to refine our faith and burn off impurities. This trials are not themselves good, but God can use them for good as He refines our faith. God does not always take away our sufferings because these can help us to grow in faith and character. There we are to "consider it pure joy" (James 1:2) when these seasons of struggle come because we know that somehwere in there, God is doing His work. 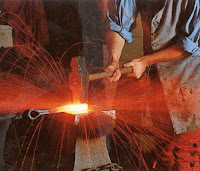 In his first book, On the Anvil, Max Lucado uses a similar image as he asks us to see God as a blacksmith hard at work at his anvil. We are the tools that are to be found in God’s blacksmith shop. Some tools are new and sharp and ready to be used by the blacksmith. And there are some Christians who are mature and ready to do the Master's bidding, ready spend their lives and be spent in His service. Some tools are broken and no longer useful. They are discarded in the corner, fit only for the rubbish heap. And there are some Christians who have given up the quest to be like Jesus and have returned to the world. Some tools are on the anvil, being repaired and sharpened so they can be useful again. Most of us are on the anvil being reshaped by God. He pounds and chisels on us so that we become more and more like Him. This image is a painful one— we are on the anvil to be beaten, thrust back into the fire, beaten some more and plunged into cold water. Some of you may feel just like that right now. This process of growth and maturity is both necessary and painful. But if we will just hold onto our faith, God can use our anvil experiences to create in us something strong and glorious.